Bio-Solid-phase microextraction (BioSPME) is a simple, fast and sensitive non-exhaustive sample preparation technique that allows the integration of sampling and sample preparation steps. The objective of current research was to automate SPME in 96-well plate format for the first time. The proposed system allows sample preparation of >1000 samples/day, simultaneous determination of both free and total concentration and suitability for performing ligand-receptor binding studies. Open-bed configuration of SPME enables direct handling of heterogeneous matrices such as whole blood, thus further simplifying the entire sample preparation process. The automation of SPME in 96-well plate format enables the highest throughput of any SPME technique to date. In metabolomics studies of biofluids, the efficiency of metabolism quenching and stability of analytes in selected biofluid dictate how accurately the analytical results represent true metabolome composition at the time of sampling. However, complete quenching of metabolism is not easily accomplished and/or changes due to poorly stable compounds can occur, so the processes of sampling and sample preparation can significantly affect metabolome’s composition. 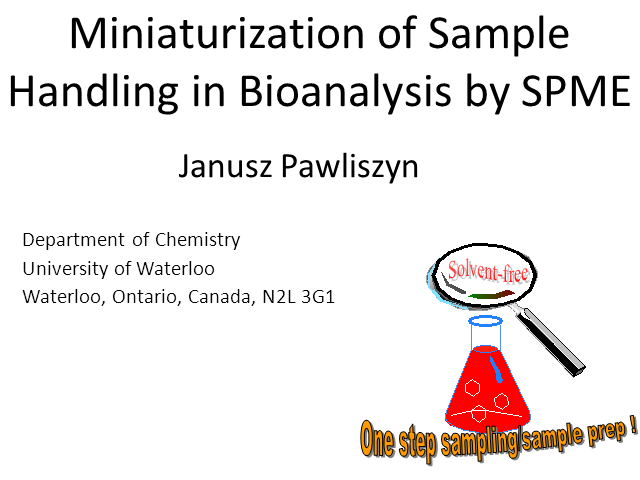 The use of SPME for direct in vivo sampling of drugs and metabolites in the bloodstream of freely moving animals eliminates the need for blood withdrawal in order to generate pharmacokinetic (PK) or metabolomic profiles in support of pharmaceutical drug discovery studies. This is particularly important for situations with a limited blood volume such as mice because it enables the use of a single animal to construct an entire profile or conduct longitudinal studies. The aim of the current research was to apply SPME for in vivo sampling in mice for the first time. Furthermore, we investigate the use of in vivo SPME as an effective sample preparation method for both targeted pharmacokinetic and untargeted LC-MS metabolomics studies.